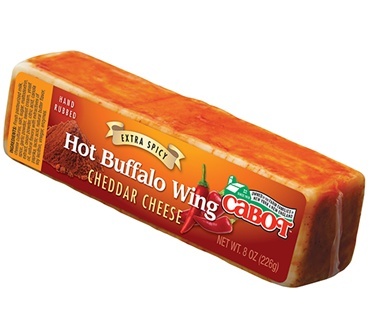 The sizzle of Buffalo wing sauce hand rubbed onto cool Cheddar. Outstanding! Spicy and salty buffalo rub tamed by smooth cheddar. Epic!!! Simply awesome...It has enough of a kick to make spicy cheese lovers smile but is quickly tempered by the smooth cheddar. My second favorite next to Oren Meadows. Another one of my favorite flavors. Love the kick at the end! I order this cheese because it is amazing! We love this cheese, we can't find it locally so we order it in bulk! This cheese is delicious with the right amount of spice! This cheese is perfect on a cracker or shredded in salad. Creamy cheddar with a hint if buffalo spice.